One of the first true masterpieces of medieval manuscript illumination, The Winchester Psalter is a jewel of the collection amassed by the great antiquarian Sir Robert Cotton (1570-1631), which formed the basis of the British Library. This 12th-century manuscript is justly famous for the cycle of miniatures depicting scenes from the Old Testament, the lives of Christ and the Virgin Mary, and the Second Coming and Last Judgement, which precede the text of the Book of Psalms. 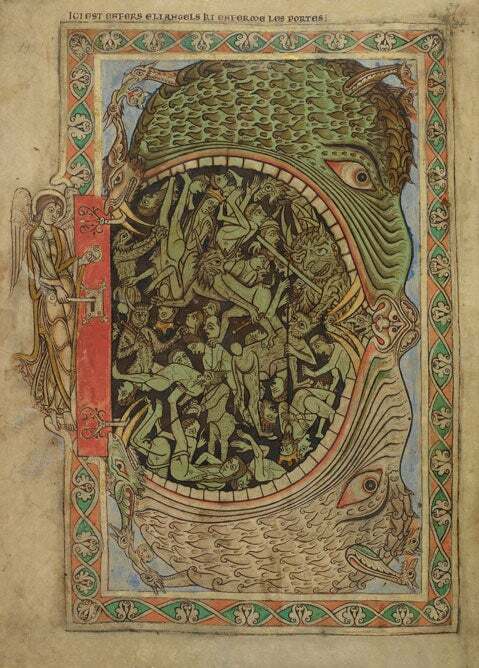 Inspiring, edifying and terrifying in equal measure, the miniatures of The Winchester Psalter represent the pinnacle of English Romanesque manuscript illumination. 13¾" × 9¾" × 2¼"
The turn of the first millennium witnessed a remarkable outpouring of creativity across Europe from artists in all media. Architecture, sculpture, stained glass, painting, manuscript illustration and embroidery all responded to the pre-existing models of classical and Late Antiquity with an extraordinary burst of imagination which combined both deference and independence. This first great movement in medieval art – labelled ‘Romanesque’ by 19th-century scholars for its adoption of features of Roman architecture – flourished until the arrival of Gothic in the 13th century. A distinctive tendency within Romanesque evolved in England and northern France, especially in the art of manuscript illumination. In Bibles and psalters, miniaturists drew inspiration from Byzantine and late Anglo-Saxon artistic traditions to forge a remarkably elegant and complex style of biblical illustration. The 38 prefatory illuminated folios of The Winchester Psalter are one of the greatest and most original expressions of this new art. To accompany this edition we have commissioned a new commentary from Kristine Edmondson Haney, Professor Emeritus of Art History at UMASS and author of The Winchester Psalter: An Iconographic Study. A member of Phi Beta Kappa, she has also received both the Woodrow Wilson Fellowship and the National Endowment for the Humanities Fellowship. The Psalms played a central role in the public and private lives of Christians in the Middle Ages – in daily prayer meetings and in the liturgy of the Mass and the Divine Office, as well as in private prayer and study – and they were extensively copied as a separate book. By the time The Winchester Psalter was written and illuminated around the middle of the 12th century, glosses were widely available to clergy and laity alike, and the Psalms had become a primer for children learning Latin as well as a key devotional and penitential text for Christians of all ages. Drawing on a tradition from Anglo-Saxon England, psalters of this period included an extended pictorial preface in which imagery supplemented the moral message of the text. 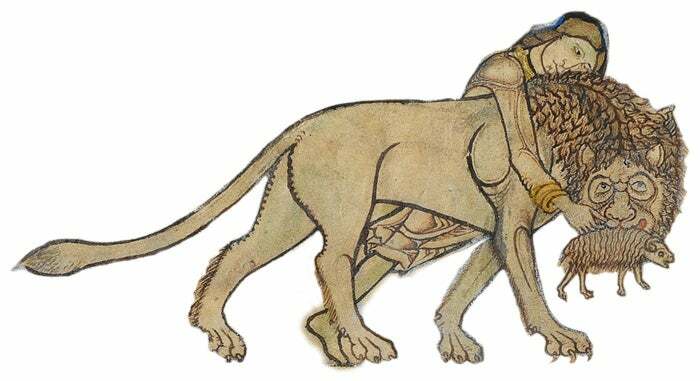 In The Winchester Psalter this is deployed to extraordinary effect. The cycle of miniatures in The Winchester Psalter is essentially a visual guide to salvation, providing the reader with clear models of good and evil and their reward and punishment. The scene of Christ’s betrayal (folio 21) is an arresting example of this morally charged art, as the tall, handsome and distinctly Byzantine figure of Christ bends back to receive the kiss of Judas, while this central pair are flanked by a group of sinister figures, whose beak-like noses and sharp fangs recall the grotesque depiction of the devil in the earlier Temptation scenes (folio 18). The intense characterisation of the struggle between good and evil in these images – the work of an anonymous miniaturist associated with the scriptorium of Bury St Edmunds – reaches a stunning crescendo in the Apocalypse scenes of the last nine folios in the cycle, culminating in the famous final miniature of the angel locking the damned in Hell (folio 39). The bodies of the damned – including some clergymen among the laity and royalty – are impossibly twisted and seem to float in a space lacking gravity, cut off forever from the world they have lost, tortured by grinning demons while the angel serenely despatches them for eternity. For an audience which believed literally in the Day of Judgement this scene is at once a beguiling and devastating climax. Never had the terrors of Hell seemed so immediate. The original provenance and ownership of the manuscript remain tantalisingly elusive. The calendar, the litany and the prayer to St Swithun, whose remains are described as ‘in this nave’, all indicate an association with Winchester Cathedral, while two feasts mentioned in the calendar establish a connection with Cluny Abbey in France. This evidence suggests that the most likely original patron was Henry of Blois, grandson of William the Conqueror and brother of King Stephen of England, formerly a monk at Cluny and then Bishop of Winchester from 1129 to 1171. A great collector and lover of art who had made generous gifts to both Winchester and the abbey of Glastonbury, Henry is likely to have ordered a great psalter for his personal use. The subsequent history of the Psalter is similarly intriguing. The manuscript migrated from Winchester to the Benedictine nunnery of Mary and St Edward at Shaftesbury, where the red Anglo-Norman captions were added, but after the mid-13th century its whereabouts are completely unknown, and the subject of much scholarly speculation. It next appears in the early 17th century in the collection of Sir Robert Cotton, and was eventually presented to the nation in 1700. Following a fire which ravaged the Cotton collection in 1731, the pages of the manuscript were trimmed, remounted as individual folios and placed in a new binding, preserving the Psalter for posterity. David as a shepherd rescues the ram from the lionfolio 7, top panel (detail). All quotes are by Kristine Edmondson Haney.